Every day there are people who are creating change in schools and communities. For every person finding success in bringing about change, there are another 100 people trying to figure out how to do it themselves. Share a story or plan your own R-Word awareness event and let others know about your success stories so we can help everyone learn how they can be agents of change and acceptance. The R-word hurts because it is exclusive. It's offensive. It's derogatory. Our campaign asks people to pledge to stop saying the R-word as a starting point toward creating more accepting attitudes and communities for all people. Also, take the pledge to spread the word on inclusion! Language affects attitudes and attitudes affect actions. Pledge today to use respectful, people-first language & to celebrate inclusion! Help us raise awareness year round about the hurtfulness of the R-word (retard) by taking the pledge to never use this word again, sharing your stories, and/or planning an R-Word awareness event. This is a starting point toward spreading the word to end the word and creating more accepting attitudes and communities for all people. 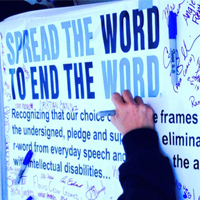 Take the pledge and show your support to eliminate the demeaning use of the r-word & to spread the word of inclusion!